Hi guys got my tone port today pluged in the mic and cant get any sound out of if got all the latest drivers it says to select source to mic and there is no select source tab ???????????? p.s. can you post a screen shot of your gearbox open here ?? 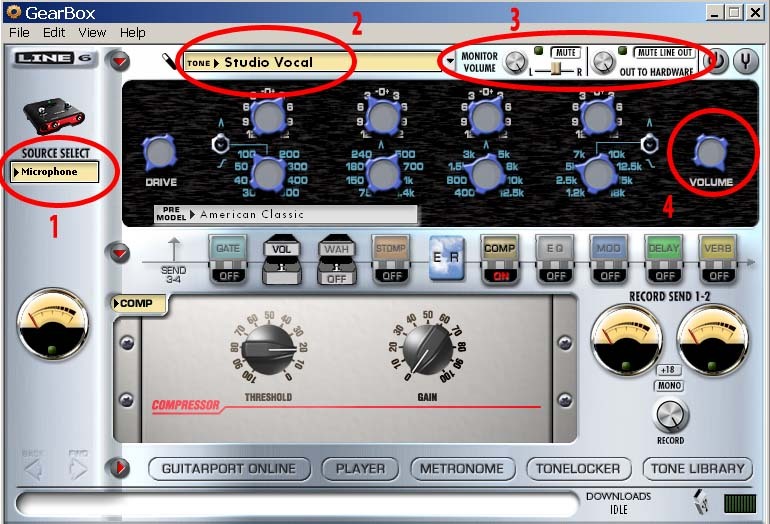 Ok Im sorry man I just saw that you have the GX version of it..So there is no separate mic input therefor no need for source select..Just plug in your mic (as you would guitar) and choose a vocal patch...Can you hear guitar tone when you plug in your guitar ?? Same should apply to MIC.. Sorry I havent seen earlier that GX don't have separate inputs..
Hmm when you turn on (plug into usb) your tone port.Start the gearbox software.Plug in headphones in the back , turn up the master knob in the front of the toneport itself..Then plug your mic choose patch and sound should come out..Also toneport is a sound card , try going in windows to My Computer>Control Panel>sounds and audio devices>to audio tab there>and for sound playback choose toneport as the default device.. Now every sound from your computer you play (movies,mp3) should come out through toneport...Maybe ear phones are not working ? 4 - check the volume. make adjustments to the presets. Also tell us what computer configuration you have. I've had a weak computer before and the driver gave me troubles. It helps if you disable you integrated or other sound cards in the system. It will get stable then. Try that.